Please refer to our stock # 1817 when inquiring. 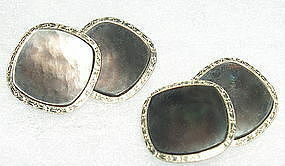 A handsome pair of double sided cufflinks 14K gold pair with rounded square slightly concave medium gray iridescent abalone pearl set in a white gold leaf or wreath design around the edges with yellow gold backs and findings. Marks: 14K YG WG with the shirt stud logo for Larter - maker of fine gentlemen's jewelry - although anyone could wear these.